Bacteria and other nasties easily hide in those wrinkles. If your shar-pei doesn't suffer from a skin disorder, consider yourself lucky. Dealing with dermatological issues is part of life with your wrinkly companion. Good hygiene and daily examination of your dog's skin can nip some problems in the bud. Find a vet familiar with the breed. According to shar-pei veterinarian Dr. Jeff Vidt, dermatology is the No. 1 problem area in the breed. Some skin issues result from food, flea or environmental allergies, causing skin inflammation such as hot spots. If your dog suffers from allergies, skin reactions include not only constant itching but also hair loss and infections. It takes only one flea to drive your sensitive dog crazy and wreak havoc on his skin. The wrinkles provide an excellent breeding ground for bacteria and yeasts. You might find lumps on your dog's skin, which require testing to determine whether they're malignant. 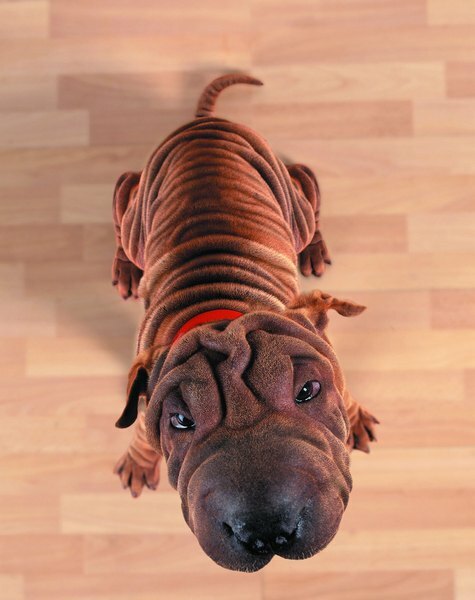 According to Vidt, demodectic mange is the most common shar-pei skin concern. While the mites causing demodectic mange live on most healthy canines without issue, that's not true of the shar-pei. Localized demodectic mange affects younger dogs, resulting in hair loss and inflammation on the head, legs and trunk. Although treatment is needed, your dog might outgrow his mite sensitivity. Generalized demodectic mange occurs in older dogs and is much more serious. Your dog might suffer from lifelong skin infections. Medication can treat demodectic mange but can't cure it. Don't breed a shar-pei with generalized demodectic mange, also known as demodecosis. While skin fold infections can flare up anywhere on your dog's body, they're most likely to affect his muzzle. You'll notice his skin reddening and smell a foul odor. Because your dog has short, bristly hairs, if they become ingrown they can cause skin infections. That generally happens with pyoderma, usually found on the feet. Cutaneous mucinosis, a condition causing bubbles in the skin that leak fluid, is common in the breed. If your dog's thyroid glands, located in his neck, aren't producing sufficient amounts of hormone, hypothyroidism results. Because the thyroid glands regulate much of your shar-pei's metabolism, it affects many of his bodily systems, but skin problems and hair loss are the most obvious symptoms. While hypothyroidism often occurs in shar-peis, the breed is also prone to sick euthyroid syndrome, with symptoms resembling hypothyroidism. Your vet measures the hormone levels in your dog's blood and can prescribe thyroid hormones if your dog is deficient. 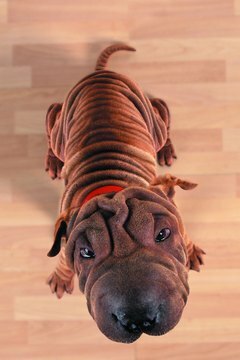 Although you might not completely prevent your shar-pei from experiencing skin issues, taking certain measures make them less likely. Good flea control is essential, so make sure your dog is on a monthly topical or oral medication for flea prevention. Brush him daily and clean out his wrinkles with a soft cloth. Bathe him once a week -- ask your vet to recommend a specific shampoo -- and keep his environment clean. Feed him high-quality dog food.